Balancing Rock Sunset | Just Shooting Memories! In all the travels I have made to Blood Mountain, I have always taken the Byron Reece trail to the Appalachian Trail and then to the top of Blood Mountain. I was surprised this last time when my brother asked if I have ever seen this balancing rock. I had not and he pointed me the opposite direction (North) on the Appalachian Trail from Blood Mountain when we reached the trail. Not more than a couple hundred yards down the trail is a massive boulder balanced on top of another. There is very little touching between the two. 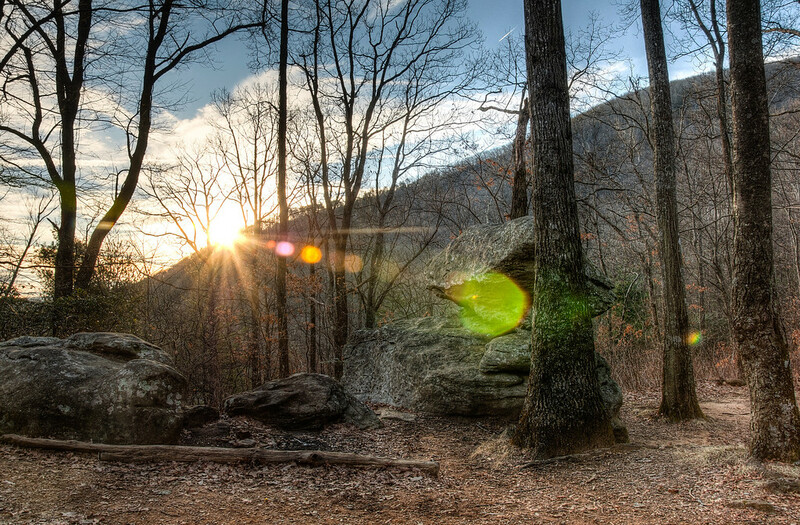 On our way back down from the summit of Blood Mountain, we stopped by the balancing rock just as the sun was setting behind the shoulder of Blood Mountain.